One aspect of writing for Psychology Today that I really enjoy is that I receive numerous emails from people alerting me to news items I might have missed. 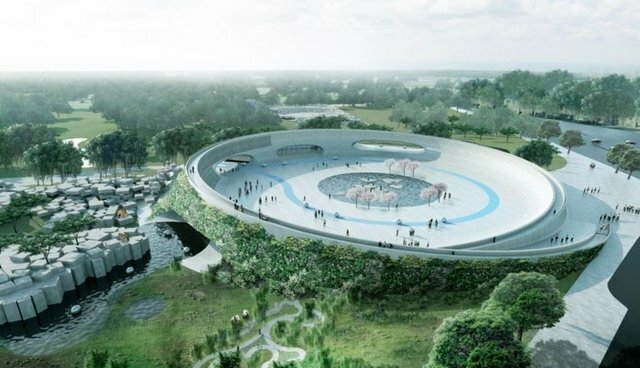 One project about which I hadn't known that generated a lot of alerts involved futuristic plans to build a "cage-free" zoo in Denmark by the Danish architecture firm called BIG. This project has generated a lot of press and two good reviews can be found in an essay in Slate called "A Cage-Free Zoo That Helps Hide the Humans From the Animals" by Kristin Hohenadel and in an essay in The Guardian by Oliver Wainwright titled "Denmark's cage-free zoo will put humans in captivity." Can zoos really be cage-free or cageless? This essay is more an alert about this ambitious project, as it is a work in progress, and an answer to a large number of queries about whether or not zoos can truly be cage-free, cageless, or enclosure-free. They cannot. And, the titles for the above and other essays, truly are misleading for there will be cages and the humans will not be placed in captivity. Zoos, by definition, are holding their residents captive and of course they have to do this. Whether the homes of the animals are small, medium, or large, and even if they're called "enclosures" or "habitats" for a specific animal with relatively invisible barriers or full of water, they still are cages because they restrict the movements of the animals, as they must do. And, the visitors are free to come and go whenever they choose to do so. Furthermore, the animals will know that humans are present even if they cannot see them. One of the most fascinating and alluring aspects of the sensory worlds of other animals is that they see, hear, and smell things about which we have no sense or awareness at all. Their unique sensory worlds -- bat ultrasound, whale and elephant infrasound, and the amazing noses of dogs and other animals -- are among the many reasons we want to learn more and more about them. This "cage-free" project called to mind a wonderful book by the renowned philosopher, Tom Regan, called Empty Cages. The major message of this seminal and challenging book is that many people want to see animals released from all sorts of cages, and that making a cage larger or invisible is not good enough because the individual's freedom still remains highly restricted and compromised. The bumper sticker for this book simply is, "Some people want empty cages, not larger cages." Bigger is not good enough. and of course. for many of the animals held in zoos, we can never ever meet the space, social, and other requirements that they need to have a quality life or a life that resembles that of wild relatives. So, I surely like the idea of a "cage-free" zoo, but it's an impossible goal. Some of the animals might have a "better life" in these environs than in others, but they still are captive beings whose lives aren't close to being what they would be if there really were free to roam absent the confines, whatever they may be, of a ... cage. And, "better" doesn't mean "good" or "good enough." Because this project isn't slated to be completed until 2019, there still is time to make suggestions that could make the lives of the residents even better than the architects plan. Either way, it's essential to remember that a cage is a cage is a cage and that a "cage-free" or "cageless" zoo is an oxymoron.